Implicit conversions seem to be a growing trend in the SQL Server performance tuning work that I’ve been engaged in recently, and I’ve blogged in the past about ways to identify when implicit conversions are occurring using the plan cache. For those of you who don’t know, implicit conversions occur whenever data with two different data types are being compared, based on the data type precedence. The precedence establishes the hierarchy of of the types, and lower precedence data types will always be implicitly converted up to the higher precedence type. These conversions increase CPU usage for the operation, and when the conversion occurs on a table column can also result in an index scan where an index seek would have been possible without the implicit conversion. For a long time I’ve wanted to map out the most common data types and the effect of a column-side implicit conversion for creating an index seek versus an index scan and recently I finally got around to mapping it all out. To map out the implicit conversion affects I created two databases using different collations, one using SQL_Latin_General_CP1_CI_AS and the other using Latin_General_CI_AS, and then created the following table in each of the databases. I then created a nonclustered index on each of the columns in the test table so that a single column query filtering on each column could then generate an execution plan with a single index seek when using the matching data type for the filtering. Finally each of the tables was loaded with 467000 rows of random data and the indexes were rebuilt to remove any fragmentation before testing was started. The test harness first connects to the instance of SQL Server and retrieves the column list from the database for the TestImplicitConverts table and stores them into an ArrayList that is then used to iterate over the tests, generating dynamic statements and at the same time using a different type for each test. The types are selected from the SqlDbType enumeration in .NET and filter out the types that are not being tested as a part of this investigation. Each test is executed with SET STATISTICS XML ON to collect the actual execution plan for each of the tests for processing to determine if the implicit conversion caused a scan to occur or not. Then the results of each test is output to the host as a comma separated list that can then be placed in Excel and used to generate a chart of the implicit conversion effects. Note: The full test harness and scripts are attached to this post. The results of the tests are mapped out in the two charts below. 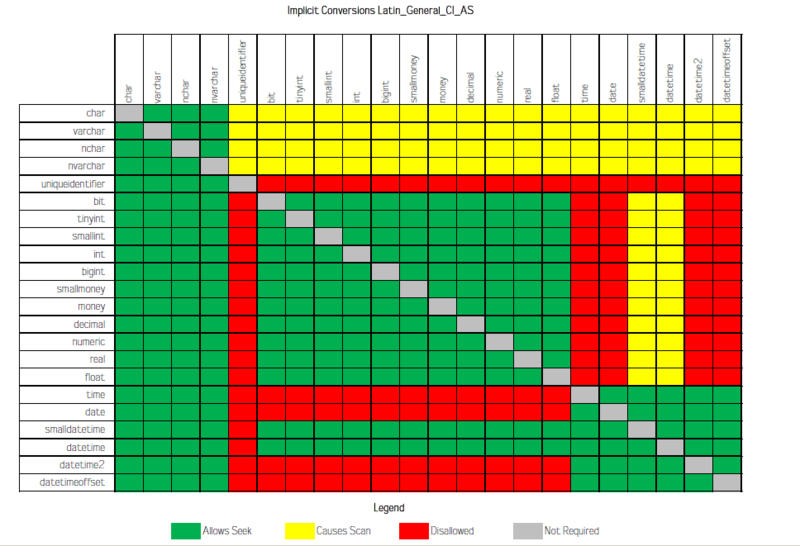 The green blocks show where an implicit conversion occurs but still results in an index seek operation. The yellow blocks show where the implicit conversion causes an index scan to occur. 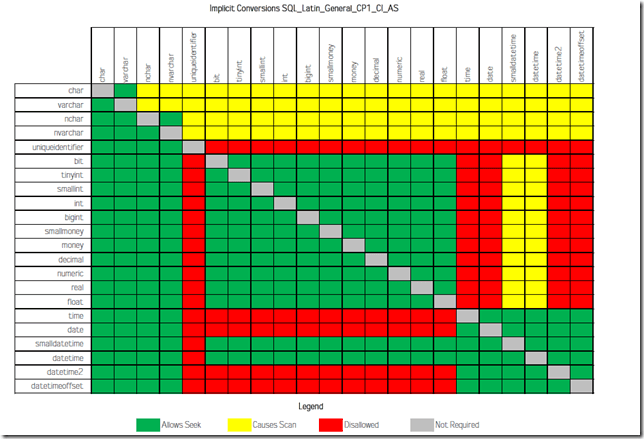 The red blocks show where an operand clash occurs and implicit conversion is not actually supported by SQL Server for the data types, and the grey blocks are the same data type, so no conversion was required. There is a difference between using the SQL_Latin_General_CP1_CI_AS collation and the Latin_General_CI_AS for the char and varchar data types, when converting to nchar or nvarchar. In the SQL collation the conversion results in an index scan as shown above, but in the Windows collation, the scan does not occur and an index seek is still used to execute the query. 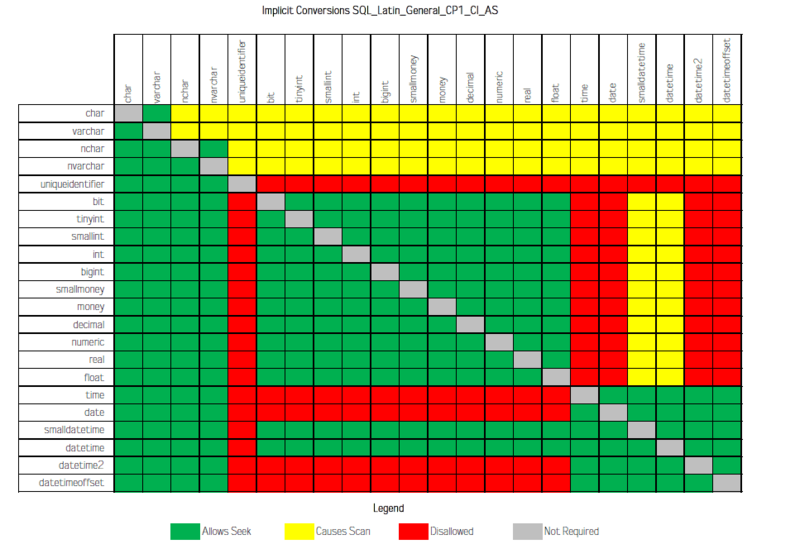 While implicit conversions occur in SQL Server to allow data evaluations against different data types, they can introduce performance problems for specific data type conversions that result in an index scan occurring during the execution. Good design practices and code reviews can easily prevent implicit conversion issues from ever occurring in your design or workload. Todd, exactly what did you change in the config file ? We are running into this problem at my present employer with the jTds driver. I’ve been using your script to regularly query implicit conversions in the plan cache, and have seen a reduction of index scans and, by extension, query execution times, as a result. Nice buildup of the case, well explained. And it contained the Powershell code I happened to be looking for at this moment. I have similar script but that is pure sql script and that looks at the Index scans due to Implicit conversion or Index scan due to usage of function. It provides other details like function or conversion data types, Possible impact as well like how many number of rows are being processed each time during index scan etc. There is a column in output “MostImportantFactor_total_row_processed” which could be used to determine which sql’s needs to be fixed first. The worst thing of the Index scan(due to conversion of function) is that number of CPU operation it has to perform to compare the data and could kill the CPU. One small query caused my 24 cpu machine to have cpu usage of more than 80% just because of the Index scan due to conversion (it was using function as well). Fixing this brought CPU to around 2%. It might run for long time if the cache plan is quite big. Thus if running on Prod be careful. In case cacheplan is quite big then I usually prefer to get the column,index,table ,function, predicate details in one go from query_plan dmv and then join this data with the other tables to get more information. Sometime, I go to query_stats dmv and then find queries with highest CPU time and then look whether index scan is happening for that query. This Makes sure that I query minimal data from these dmv’s. I have a similar issue when i use SQL_Latin_General_CP1_CI_AS collation. Please suggest a code fix for this for my indexes to work. The only code fix is to match your filter parameter types to the column data types. Or change your underlying data types to match what the parameterization is going to pass through in your code for filtering parameters. You can’t do anything other than these two things. Great work and awesome learning for the readers ! Great post, thank you, helped a lot with a recent issue I was having. 1 question: How come varchar in Y Axis paired with nvarchar in X axis results in an implicit conversion, but nvarchar in Y axis paired with varchar in AX axis does not? What’s the difference between the 2 scenarios ? If the column is varchar and the parameter is nvarchar it requires a column conversion up to unicode. If the column is nvarchar and the parameter is varchar, the parameter side get’s converted up to unicode, so it doesn’t cause a scan in the second case. What if the implicit conversion only occurs on non-indexed columns? Would that be as bad?